Most books on politics and government take a view from the top down. They focus on the individuals and institutions that set policies in place and make the laws. But how are these policies and laws translated into action on the ground, where their success or failure helps determine the day to day running of schools and hospitals, police forces and councils? This is the much less familiar territory explored by Follow The Money. It tells the story of the men and women responsible for keeping track of the money spent locally on public services since the early 1980s. What emerges is a rare behind-the-scenes account of the political world in which central government edicts come up against the reality of how things are made to happen at the grass roots. 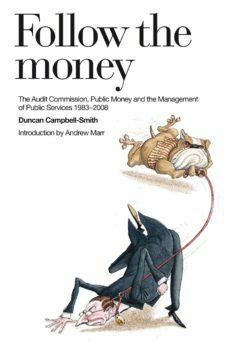 Follow The Money shows how the Commission has helped over 25 years to transform the management of public services, including the NHS, while mediating in an often tense relationship between central and local government from the Thatcher era to the years of New Labour. The result, encompassing a string of scandals and battles between town hall and Whitehall, is a compelling narrative for which an accounting qualification is most certainly not required.